Great news! Wasn't Snowball the one that got adopted and was later returned? And, poor, poor Boucca! M2s break my heart! It's so very difficult to find them good homes... they should outlaw breeding them for the pet trade. Is the GCC going to be DNA'd and, if it's a male, are you going to adopt him for Ocean? I also have a budgie in quarantine right now. 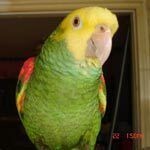 I had ended up with too many females and have been looking for a male or two in Cl when somebody contacted me after they found one flying around in their backyard so I took him in [I did check parrot911 and CL for postings on lost budgies but none matched his coloring]. I call him Duke because he is of a darker blue than the liver damaged female I took in from my contractor which I named Duchess for her beautiful 'necklace'. Cheerio the U2 was the one who was adopted and came back. Snowball has never been adopted. He's going to a good home and the woman has had a G2 before, so it should work out. The DNA test on the GCC is not back yet. There are so many budgies flying around!!! Duke and Duchess are good names! 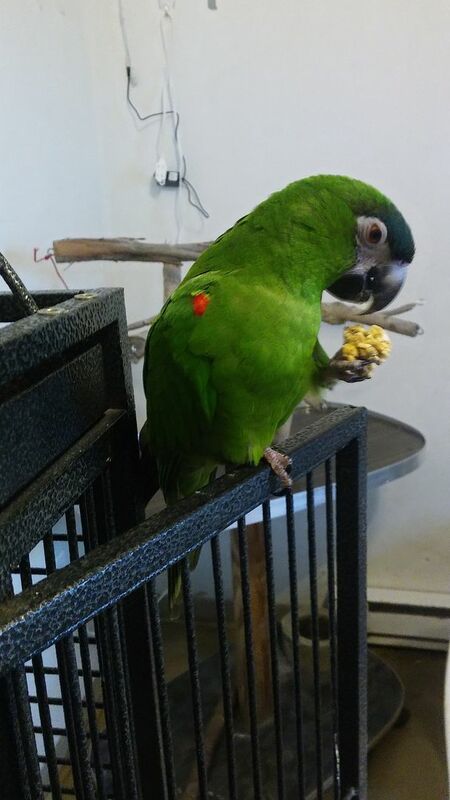 Our little Hahn's Macaw, Birdy B, went home yesterday. Hahn's are wonderful little birds! I had a Noble/Hahn's pair at the rescue which was adopted by a guy who did presentations in schools with them because they had become so very tame and sweet. Birdy B will do great in its new home! We had someone leave a young-looking Blue and Gold macaw on a railing at the rescue at around midnight last week. Luckily the manager lives in an apartment above the rescue. He dog was going nuts so she went outside to investigate. So lucky the bird didn’t get grabbed by a raccoon or get scared and fly off. We have named the bird Midnight. No band. I tried to chip scan her and got no results. Sheesh! People really piss me off! Now, I ask you, why would anybody risk the bird's life this way?! It's stupid! You would have taken the macaw if he/she had come to you the 'normal' way! Pajarita wrote: Sheesh! People really piss me off! Now, I ask you, why would anybody risk the bird's life this way?! It's stupid! You would have taken the macaw if he/she had come to you the 'normal' way! Well, there is a relinquish fee of about $100, I think. It would just be nice to know the bird's name and age. She has dark eyes so I think she's young. Babies can be given to a responsible person with no questions asked. I guess that needs to be done with birds too. It would help with asking birds name and any history without the person having to be accused of neglect. I seriously doubt the person would have been questioned in any way that would make him/her feel bad. That's one of the first things you learn when you do rescue - namely, that if you antagonize in any way the person who is bringing the animal, you can end up not being able to help the poor thing. So you learn to bite your tongue and put on your poker face even if you hear or see something that makes you real mad. And the volunteers that fail at this are not allowed to deal with the public.